PACG, Starring Not Your Typical Goblins! Over here at Pathfinder Adventure Card Game HQ, we're getting very excited. The new Pathfinder Adventure Card Game: Core Set and the Curse of the Crimson Throne Adventure Path are due for release in May. So we've got news about your PACG subscription! If you choose to start your sub with the previous release—the Ultimate Wilderness Add-On Deck—you'll also score a free copy of last year's Free RPG Day promo character, Nok Nok. If you choose to start with the Core Set, you'll get both the Core Set and Curse of Crimson Throne. 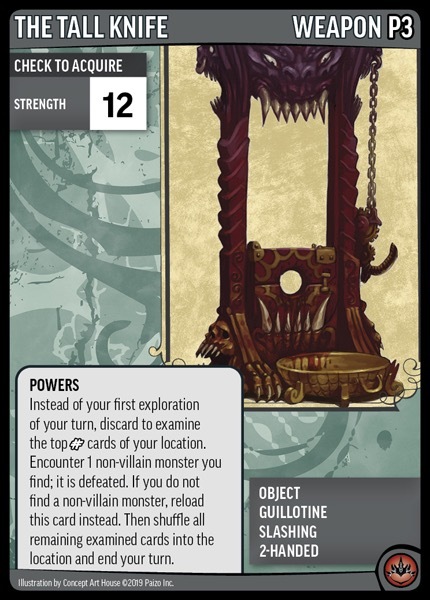 If you choose to start with Curse of the Crimson Throne, we won't send you the Core Set; this option is especially useful for non-US subscribers who want to get most of the subscription benefits without having to pay the unfortunately hefty international shipping fees for Core, which weighs in at a bit over 4 pounds. And what are the benefits? Subscribers get 20% off the MSRP of their subscription products, plus subscribers occasionally get free promo cards. What? "Embiggen" is totally in the OED. Look it up! The armor Corpse Plate will be available at larger Pathfinder Society events in the next year, starting at PaizoCon on May 24. 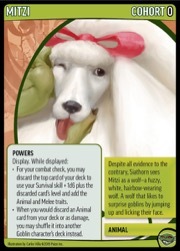 The spell Embiggen will appear in an upcoming issue of Game Trade magazine. Free RPG Day is June 15, less than a month after we release Core and Curse. So we've got a special treat: goblins! OK, sure, we've done a goblin character every Free RPG Day for years. So what makes this year different? We're not just releasing a character—we're releasing a storybook. We Be Heroes? is an 8-page storybook for the new Pathfinder Adventure Card Game Core Set. It's a PACG adaptation of the Pathfinder Module of the same name being released at the same time for use with the Pathfinder RPG. 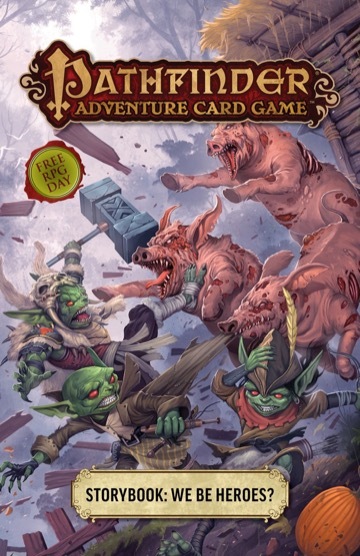 It features four new heroic goblin characters from the Crookedtoes tribe: the barbarian Grenek, the ranger Crimsi, the druid Siathorn, and the bard Pizazz. They're not terribly good at being good, but they're working on it. Their opportunity comes when a group of paladins get in trouble, and our heroes need to get them out alive. Can they defeat the Blasted Chicken that squawks in their way? Only you can help them. 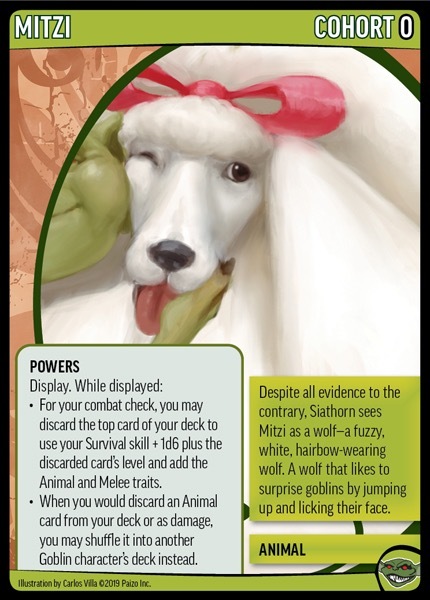 Oh, also, Siathorn has this wolf cohort. If you can't make it to a participating store for Free RPG Day, don't worry: starting July 1, you can get the PDF for free from paizo.com, or you can pay a mere $3 for the print edition. So all that's very exciting! We hope you'll sign up for that subscription and get those promo cards, then keep an eye out for We Be Heroes? in June. It's all coming soon! I think we've provided enough background in previous Core Principles blogs that most of the mechanics on these cards should be pretty clear. If I'm wrong about that, go ahead and ask! Corpse Plate shows off a new "draw while displayed" armor activation that I think a lot of you will quickly come to appreciate. Each new blog makes me even more excited! On that topic- Is there any update about if/when WoTR and MM promos will be put in the shop? Also, will the Core/Curse promos be made available in the shop as well? It sounds like the new promos will have a few different ways to get them which is great but are the same time I personally would love to see all of these in the shop even if that means a year from now (I.e. Time exclusive initially and then publicly available). I will poke our store manager on the WotR/MM promos. Cool promo cards, and a Free RPG Day book to use the new core set as a core set, right away! Very nice. Hi Vic, I'm not sure I understand how subscribers may get access to the physical copy of the Goblins We Be Heroes cards, especially for poor guys living far away from US Free RPG Days events. 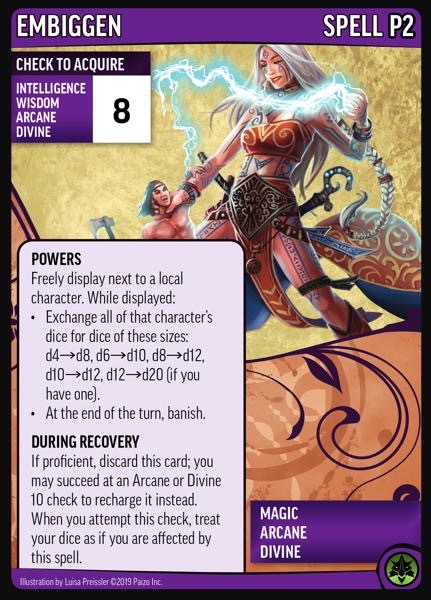 So not all the promos for PACG 1st edition ever made it to the site to buy directly. Are you doing things better to make it so we'll actually be able to get everything with PACG 2nd edition? It's really irksome not being able to get a complete set of the game. Very interesting goblin adventure and adventurers. On the bard, Pizzaz (pun intended), there is one instruction that made me smile. You have to whistle a tune and recharge a card to use ?his? second power. So the player has to whistle a tune, otherwise it won't work? Thematic for a bard! It reminds me of funny Magic the Gathering editions - such as Blacker Lotus and Ashnod's Coupon cards. this option is especially useful for non-US subscribers who want to get most of the subscription benefits without having to pay the unfortunately hefty international shipping fees for Core, which weighs in at a bit over 4 pounds. I'm having trouble finding out how much those shipping fees are - would anybody be able to advise how much the postage to the UK is? I'd rather find out before it suddenly leaves my account, and switch subs if necessary. I too would like to know what the shipping to the UK is going to be like. I really wish they would find a UK and/or European partner to make these things affordable for people outside of the US. Pizazz has a wonderfully thematic diplomacy power. Once they start charming a potential ally, all of the others make themselves scarce. Pizazz is always a local character to himself, right? 1) How do subscribers get the new Goblin cards?!? Kinda curious what tiers this adventure will be since 8 pages is not a lot. Now I'm guessing it will actually be the equivalent of the B scenarios and they'll use that extra space to expand on the story told, but that booklet is technically big enough to fit an entire paths worth of content with room to spare. I'm a dumb dumb and forgot that scenario cards use both sides so need the space of 84 cards. Then I remember that they use art on both sides taking up about half a card on each side, something not necessary in the book so we can remove the duplicated image and fit it all back in again. 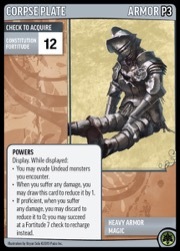 The other blog posts told us that they're not making cards for the Adventure Path/Adventure/Scenarios in the new set, instead using a more flexible format in a booklet like the Guild Scenarios. This is an adaptation of a short RPG module, so I'd expect it to be 1 Adventure of 4-6 Scenarios in Card Game terms. 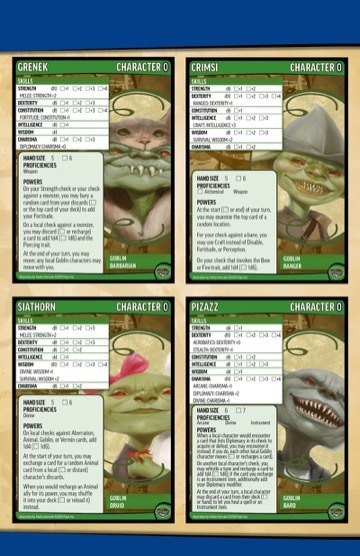 The Goblin character page above appears to be page 8 of the booklet, based on the file name. Given the size of physical cards and what they've said about the new story booklets, I'm going to guess that this is a 5.5" x 8.5" page and there are actually 16 of them in the product (8 11" x 8.5" sheets). You'd need 4 of those pages to proxy a complete Character, or 2 if they don't come with Role cards in the booklet. They'll also use a few pages for proxy Story Banes, the Mitzi Cohort, and such. The rest is the Adventure at 2 pages per Scenario. The We Be Heroes adventure is 8 pages that are 5.5" x 8.5". We did not provide role cards in the adventure because the characters are too low level in the adventure to use them, but we will be providing them in a download. I was inquiring about the power feat that was "A local player may discard a card from ..."
Yes, he is a Local character for any of his own powers. A Local character means "a character at your location" (which you yourself certainly count as). Instead of using the Subscription product (which only shows "Cheapest possible"), add the actual item to your cart. Both the Core and Curse sets can be added to your cart from the Preorder tab on this page. Then, if you click on Checkout and go to the Shipping tab, it will list the actual shipping costs. Thanks, mate. That was far from intuitive for me. For me, in Maryland, shipping for the new Core shows up as $21.68 (USPS Priority). Which is interesting, as I thought (in the past) that Australian shipping of Paizo products cost more than shipping to the UK. I suspect something's changed. That said, the shipping price seems close to par with my previous experience of shipping costs from Paizo in general, but cheaper for those who just want the cards they need to play through a standard Adventure Path. I remember being charged about $80USD or so when I bought the full Mummy's Mask AP and a handful of Class Decks ($140 worth of product at the time, but most of that was on sale). No shipping to Canada is really that expensive :( this is because unlike the EU NAFTA isn't a customs union and the majority of the cost in shipping services is the customs not the route it took. See this. "A noble spirit embiggens the smallest" Halfling, to paraphrase Simpsons. EDIT: 29.58$ for Crimson Throne shipping, plus 40$ for it's cost on the sub, and 20% VAT brings us to £63.89. If it's a gift (and clearly labelled as such on the box otherwise how will customs know), you might be able to have VAT waived. The question is, how much will a retailer locally charge? If core and throne ship together, I calculate it at £128.42. Even as a gift you are charged VAT here. If you're not buying through the sub at 20% off, you're looking at another £10-20 I reckon.